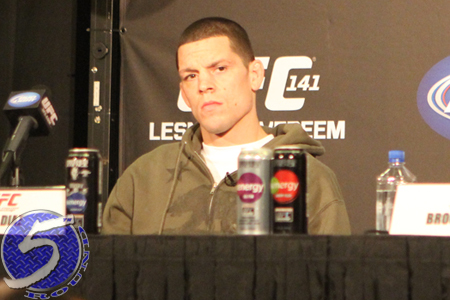 Nate Diaz (pictured) is finally ending his yearlong hiatus tonight when he meets Raphael dos Anjos at UFC on FOX 13. However, the controversial lightweight is doing so begrudgingly. Diaz hasn’t been shy with expressing his displeasure about his UFC contract, an agreement he willingly signed just three fights ago. That’s why the former top contender hasn’t been seen since TKO’ing Gray Maynard in November 2013. Diaz has reportedly turned down fight after fight, holding out to renegotiate his deal. UFC president Dana White didn’t budge, calling Diaz on his bluff and letting the 29-year-old sit as long as he pleased because in the fight business – you don’t play, you don’t get paid. So Diaz finally caved in September by accepting to co-headline tonight’s show against dos Anjos. Although, Diaz won’t be receiving any Employee of the Month plaques anytime soon. Diaz skipped Wednesday’s mandatory media workouts claiming to be unaware of when he needed to be there. He slept in instead. Diaz then shows up to Friday’s weigh-ins clocking 160.6 on the scale – 4.6 pounds over the limit for a non-title lightweight affair. Diaz was granted additional time to try to make 156 pounds, but opted to rest and give 20 percent of his purse to dos Anjos instead. Diaz hasn’t admitted that his mishaps were done intentionally, but the writing appears to be plastered all over the octagon wall. He’s not a happy camper and White has a boss’ worst nightmare on his hands – a disgruntled employee. “The Nate Diaz thing is a completely different scenario,” White said Friday on Fox Sport 1. “The guy is complaining about money, but he’s done tons of things to ensure that he gets fined. He is complaining about the CM Punk deal. It will be interesting to see how Diaz performs tonight against the third ranked lightweight in his division. The post-fight press conference will be even more interesting if he’s victorious.